This year IABC’s World Conference got its mojo back. In-person participation was at a five-year high and a new record was set for virtual participation. Well done Team IABC. Now what might we learn from this that can be used to help you make your next event or conference reach around the world? This brief article breaks down the numbers, and shares strategic actionable insights – and good practice ideas from a range of global voices. It’ll help your hard work reach further, create more connection and help set you up for deeper post-event insights and results. And it’ll also help you invite more diverse voices to participate – both in and beyond the room. This analysis is based on a Tweetbinder data set (5946 tweets) from the week of the 2018 IABC World Conference. Some 800+ retweeted others, replied to – or even better – crafted an original tweet. Some did all of the above. These tweets reached thousands around the world. Alright Mr @wtigley and Ms @Gabriettaa – the numbers are in. This time they blew a gasket though. #IABC18 was one busy event in terms of the interweb. A quick footnote on the ‘impressions’ – don’t get caught up in those too much… they’re a bit like when people used to brag about how many HITS their website had in the 90s. [HITS of course stands for ‘How Idiots Track Success’]. Now, beyond the rankings, let’s dig a bit more. Let’s explore the insight and results. Things we can learn from, and act on. From our total data set, it quickly becomes clear that it is a small minority who create most of the action. ~80% (4768) tweets came from ~20% of the participants (164 people). And within that 20 percent there’s a hockey-stick thing going. More about these super users later. Passive Audience: those counted as impressions—nice, but not actionable as such at this point. Joiners: those who sent between 1-6 tweets. Repeaters: the 20 percent who sent between 7 and 100 tweets—many of the retweets. Creators: the top 9 people who shared between 100 and 360 tweets each. Now these groups are separated by quantity of content rather than quality of content. Some would argue that the focus should be on the much vaunted “influencer.” That unicorn-like person who brings 10,000 or even 100,000 people to the party. I’d argue that that is an arbitrary, inflated term. And if you want to keep this open, participative and fun, focus on those who are inclined to contribute, whether they have 10 or 10,000 followers. Because it all runs through the same hashtag. And to be clear: winning here means real people sharing hard facts, diverse insights—and creating connection. In professional terms, it is a bit like core principles from Open Space—except the space is virtual—and it can follow the sun. Whenever it starts = the right time: and that might be weeks before-hand real-time or with some delay, even the next days, weeks and months. Whoever comes = the right people: and that includes people on the other side of the world—who in turn will bring others if encouraged, leading to a deeper and more inclusive discussion. How can you make a conference reach around the world—in real time, and over time? Start with the Creators—they’ll be the engine room that’ll draw others in. In my experience, these people want to be busy, have fun, help out—and be acknowledged. 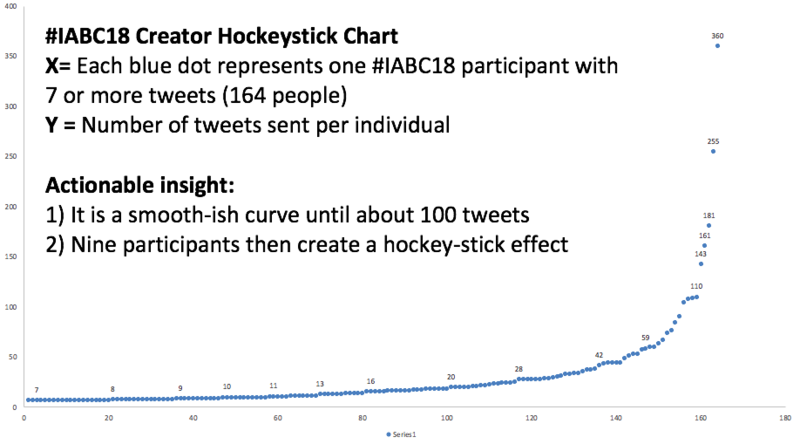 2018 #IABC18 Creator Hockeystick Chart—based on data from a Tweetbinder report. Access to relevant Brand Guidelines, Tone of Voice, Values etc.—if an IABC conference, that’s all here. An opportunity to have a chat with a real human about shared aims and aspirations. How might you find these people? Analyse earlier events—including from other organizations—you’ll quickly see the people who stand out (and they can in turn help you find others). That said, be sure to look beyond the usual suspects. Spin the globe and look for people on the other side of the world who are interested in your conference/event topic and want to participate virtually. Some might even be inspired to travel and take part in person! They’ll help you inspire the Repeaters, Joiners—and entertain the Passive Audience. With a bit of luck, it’ll take a on a life of its own. Let’s take a brief look at what the Repeaters can do for you if you have a strong core of Creators. Nice things well said are worth repeating, and to that end, here we celebrate what we might call the ‘RT Maniacs’. It is a term of endearment. I crowdsourced some ideas – from Twitter – and from IABC’s new Hub. Here’s a round-up. Be sure to RT/like if you find them useful. It seems simple, but RTing & adding commentary is huge. Don’t be afraid of the DM. Just like sitting down at a table with new people. Tweet about something other than the conference quotes to give additional convos a starting point. Your hometown, opinion, whatever fits! Tie it to your organization’s vision, mission and values. Get ideas, discuss opportunities and help them align—well in advance. Go beyond the usual suspects, check out the other continents. It’ll be a richer exchange. Use the hashtag all day every day and everywhere relevant. Think like a DJ. People need a reason to get onto the dance floor: encouragement, enthusiasm and a good beat. And a good DJ/Community Manager can set the pace and help make that happen. 5) Have an eye on the future. Reinforce the hashtag even after the event. It is that magic bit of glue which makes things findable today, tomorrow—and in ten years. Despite the 2009 headline: ‘Two Out of Three Communication Professionals Don’t Think Twitter’s Popularity Will Last‘ it is still here, and it looks set to stay. And whilst it is by no means the only tool used to share insights from conferences, it is the dominant one. That said, what this article is mainly about the humble hashtag, without which none of this analysis would be possible. Nor would the conference have been able to transcend the walls of the Palais des congrès de Montréal—on Twitter, Instagram, LinkedIn, Slack and also Google. Which is a different way of saying: this article focuses on an organizing principle for information, rather than a specific software tool at a given point in time. Librarians have been using systems to organise content for as long as there have been libraries. In recent centuries a range of competing approaches have been refined: Dewey Decimal, Library of Congress etc. and what they all have in common is that they generally have been centrally driven. A hashtag on the other hand is radical, in that anybody can come up with one. And if you use it constructively it can lead you to things you might otherwise never have found. About the author / Michael Ambjorn (@michaelambjorn) is a committed espresso drinker, #OpenSpace aficionado and an SCMP. He provides 1:1 advice to Chairs, Chief Execs and senior leaders on strategy, change and turnarounds. He is particularly interested in how strategic alignment can focus people, enabling renewal and growth. With his colleagues at AlignYour.Org, he facilitates strategy for organisations that want to enable all their people to put a shoulder to the wheel. Through courses and 1:1 coaching and mentoring they also work to develop the next generation of leaders. ← Did alignment matter in the 17th century?